For my intro Maven box, I chose the 'It Girl' (now called, 'Polish Lover'), which included the signature Julep fast dry topcoat, Leah - a bright green with just a touch of shimmer, Hayden - a opaque light orange crème, and Megan - an iridiscent aquamarine. I was only expecting the polishes in my first box. Imagine my surprise when I unwrapped my little present to myself and found a full size hand brightener cream, and samples of the hand scrub and hand lotion. I haven't tried any of them yet but will once the air gets drier. I have luckily been blessed with naturally soft and moisturized skin that only dries out when winter becomes really harsh. I used Hayden and Megan on my hands and Leah on my toe nails, and the Julep clear topcoat to seal the polish. Polish on my toe nails rarely chip or peel, so the true test of quality was on my hands. A lot of my days are spent typing on the computer so polish on the tips of my nails tend to go first. The Julep polishes on my hands lasted 4 days before chipping. Once the polish on my finger nails chipped, I cleaned them off and repainted them again but this time using my usual topcoat, the Sally Hansen cleared for takeoff topcoat. This time, the polish lasted 7 days before chipping. So, in conclusion, the Julep polishes are great! Hi-def color, non-streaky, and easy to use. The Julep fast-dry topcoat, not so great. For my next maven box, I'll definitely opt for a box without the topcoat. Hayden, 2 coats of polish, finished off with Julep's fast dry topcoat. Megan, 2 coats of polish, finished off with Julep's fast dry topcoat. Leah, 2 coats of polish, finished off with Julep's fast dry topcoat. Join Julep Maven here. For a limited time, you can get your first Julep Maven box for just $0.01! Just use code 'COLOR2012' or 'SUPERBOWL2012' at checkout. Julep works a lot like the other monthly membership clubs. They have a great referral program (2 referees who buy through your link = 1 free month for you!) One major difference is that the skip period is between the 20th and the 24th. Also, I find the process of skipping the month is a bit confusing. If you skip during the skip period but decide later on that you do want the current month's box, only the past months' maven boxes are available to purchase until a few days after the skip period when the current month's boxes become available. 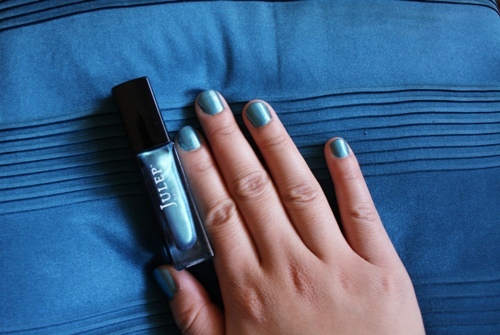 You can find out more about Julep Maven here. Did I also mention that as a member of Julep Maven, you also receive a 20% discount on Julep products? Also, $1 from every Julep product sold is donated to organizations that empower women (read more about it here). Are you a maven? What do you think of your experience so far? *disclaimer: this post was not sponsored by Julep. All opinions expressed here are my own.